Until UConn v Stanford on Dec. 30, watch the fans ! U Can't Beat that UConn Spirit ! 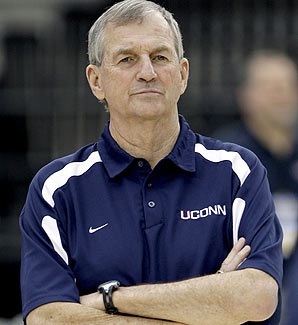 It is a common occurrence when the UConn Lady Huskies humble a Division I opponent. That was the case when I took the President of the Yankee Pug Dog Club to the Nov. 26 chewing of Howard University. The Huskies took to fresh Bison like a coyote to a lap dog. The Bison starting point guard looked to be 5’ 2” and 140 stones of solid muscle. Far too much compact mass to keep up with the young greyhounds of Storrs. 5 minutes into the game, I and the Pug Prez were certain that the smaller, heavier, less conditioned Bison would be down about 50 – 12 at halftime. It was actually 52 – 16 at the break. And the final was 86-25. To say that the Bison ran out of gas is an understatement. The walloping did not end there for the Bison as they lost their next two games by 30 and 27 points. Let’s hope they do better against the Long Island Blackbirds on Wednesday. They may have entered the pit of abject despair after their Gampel pummeling. Cross your fingers. UConn’s Maya Moore and Freshman stud Bria Hartley were as good as expected against Howard. To the surprise of many, however, a nice performance from Frosh Center Stephanie Dolson brought 13 points to the effort. 13 points is one more than Dolson scored in all THREE of the previous games combined. Now mind you when the Pug Prez hands me a nugget I think about her mixed credentials. 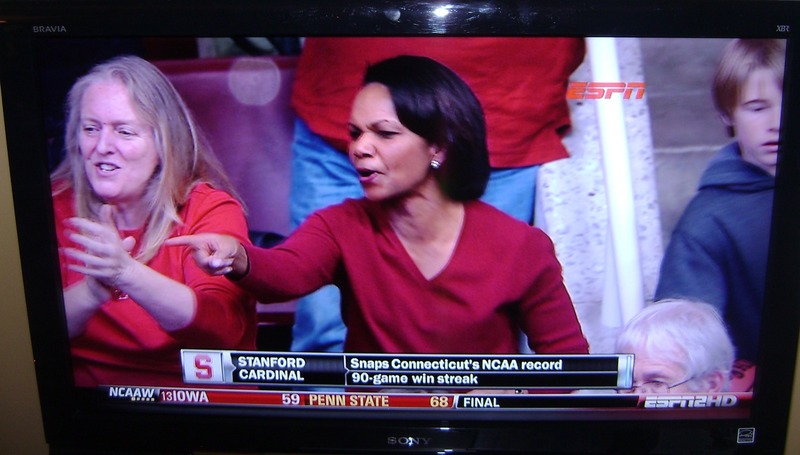 On one hand, she is a UConn Women’s season ticket holder and has been to 4 Final Fours. On the other, I have on several occasions heard her yell TOUCHDOWN ! as the baseball cleared the outfield fence in a televised MLB game. She is my sister, and I can’t always tell if she’s acting dumb or is as genuinely sports-ignorant as she seems to be. Of course, she’s right about Dolson. The Bisons made Dolson look good. It will still be a while before the Pug Prez knows as much about Sports in general as she does about Pugs, but she does know the Lady Huskies. Over the following two days UConn defeated Lehigh and LSU by a combined 162 – 89, getting wins 83 and 84. They are now 4 wins away from tying UCLA’s magical 88 straight, fashioned in the Jabbar-Walton eras under HOF’er John Wooden. They will have no problem steamrolling USF, Sacred Heart & Marquette for wins 85, 86 and 87. But they will have to best Ohio State, #7, on Dec., 19 in NYC to tie Wooden. And then defeat Florida State, #15, on Dec. 21 in Hartford to pass the Wizard. Heck. I’m not really concerned about the Buckeyes or the Seminoles or those others. UConn’s best chance to lose will occur on Dec. 30 when they face #3 Stanford in Palo Alto, seeking win 91. The Wooden record will be far, far in the rear view mirror by then. They’ll be 3,000 miles from home for that one, 96 hours after leaving Storrs, playing at 9 p.m. Eastern Time, their second West Coast game in 3 nights. They might lose that one. Not only are they on the road against a top ranked team, but UConn’s decidedly young squad faces a Cardinal team that relies upon two Seniors and a Junior. LSU Coach Van Chancellor sees the vulnerability. He told The Hartford Courant’s John Altavilla, ”The three teams that will give them the greatest problems will be Baylor…Stanford and Tennessee, teams with athletic post players….”. If Maya Moore stays healthy the Lady Huskies should continue to beat all comers by 10 to 50 points until they meet the Cardinal by the Bay. Until that time we may celebrate a new all time record but we won’t have much to inspire us. Except the amazing fan fashions created by loyalists like the one pictured above. 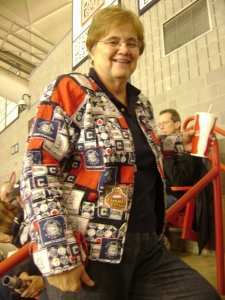 That’s an all home-made quilted sweater constructed with scraps of old UConn T-Shirts and fabric from Joanne’s. That fan is a Top Dawg. Of note: Many empty seats despite the fact that ticket prices have been reduced from $22 to $15.